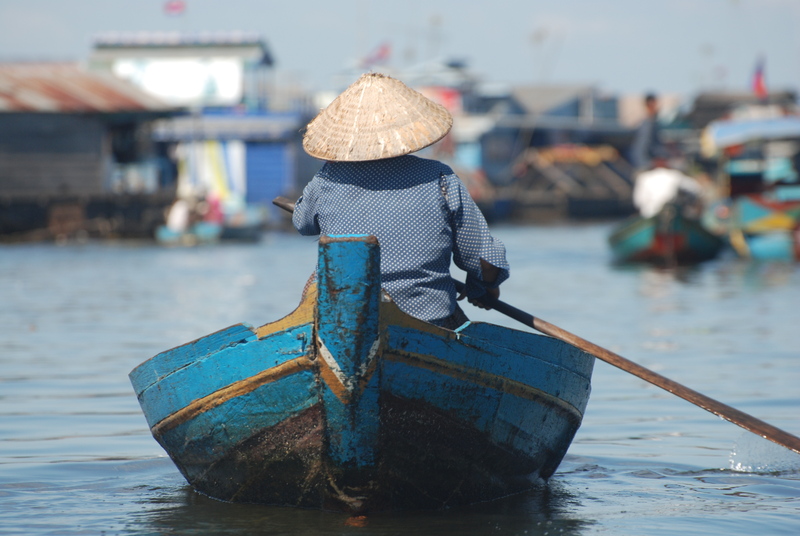 The Mekong River is an economic engine for fishermen and a food source for millions of people worldwide. Nearly 100 hydropower dams are planned for construction along tributaries off the river’s 2,700-mile stretch, which flows through Burma, China, Vietnam, Laos, Thailand and Cambodia. Arizona State University Professor John Sabo and collaborators have proposed a solution in the Dec. 8 issue of Science magazine that allows dam operators to generate power in ways that also protect — and possibly improve — food supplies and businesses throughout the Mekong river basin. The proposed solution, the first of its kind for this problem, can be applied to other large river systems around the world facing similar tradeoffs. The Mekong river floods annually, and it is known that those floods are important for fisheries, Sabo said. New in this research is the recognition that seasonal droughts are equally important. Long droughts combined with short floods may create the ideal conditions for terrestrial nutrients to be entrained into the freshwater system. With that in mind, the algorithm presented by Sabo et al. in Science recommends long low-flow periods punctuated by pulses of flooding, which will allow dam operators to co-manage their power generation priorities, while protecting livelihoods for fisheries downstream. Fish from the Henicorynchus group are vital for food security in Cambodia. The whole fish, including brains and eyeballs, which are rich in vitamin A and omegas, is ground up and used as a paste in a soup with rice noodles and vegetables. Researchers study fish in Lake Tonle Sap, Cambodia. “We have taken this conversation around fisheries and dams in the Mekong from a yes-or-no conversation, from a good idea-bad idea conversation, and we have come up with an alternative, a mathematical formula that has the possibility to achieve dam operator goals and protect fisheries,” said Gordon Holtgrieve, an assistant professor at the University of Washington. With recent funding from the National Science Foundation, Sabo, Holtgrieve and a team of researchers will expand the project to better understand how dam operators can balance power generation needs with other factors, including rice production, food nutritional quality and ecological goals. Need some finals brain food? Make these dorm-friendly egg sandwiches. Editor's Note: This is the third installment in an ASU Now series featuring nutritious recipes demonstrated by faculty from the School of Nutrition and Health Promotion, an academic unit of ASU’s College of Health Solutions. The first installment covered overnight oats, and the second installment was about electrolyte drinks. If anyone knows a tough customer, it’s Sarah Martinelli, a clinical assistant professor of nutrition at Arizona State University. Her passion is improving food quality in school districts, where you’re likely to find some of the pickiest eaters around. Luckily, almost everyone likes an egg sandwich. To that end, and in light of the close of finals week, Martinelli demonstrated for ASU Now a couple of tasty egg sandwich recipes that are so quick and simple they can be made in a dorm room microwave. “They’re fast and easy but still nutritious for students looking for a good meal to start a day of test-taking,” she said. Directions: Spray a mug or small bowl with cooking oil, and crack an egg into it. Place it in the microwave and cook for one minute. Toast the muffin, then add the cooked egg and cheese on top. Enjoy! Directions: Spray a mixing bowl with cooking oil, and crack the eggs into it. Mix well. Mix in diced red and green peppers. Rip a handful of fresh spinach into small pieces and add to egg mixture. Place the bowl in the microwave and cook for three minutes. Remove the cooked egg mixture from the bowl and let it cool slightly. Cut the cooked egg mixture into muffin-sized pieces. Toast the muffin, then add the cooked egg mixture and cheese on top. Enjoy! Before coming to ASU’s School of Nutrition and Health Promotion, Martinelli worked for a large school district in Phoenix establishing a district-wide wellness committee to address all aspects of students’ health across the school environment. “The goal was to create a culture of health but in a way that did not overburden the staff or administration,” she said. Back in September, a research study Martinelli is involved in with fellow nutrition Professor Punam Ohri-Vachaspati was awarded $3 million from the National Institutes of Health to examine factors influencing declines in obesity in some populations in the U.S. The study uses detailed data about the environments in and around schools, as well as school meal participation data collected from roughly 130 low-income, high-minority public elementary, middle and high schools in four New Jersey cities from school year 2008-09 to school year 2014-15. Martinelli also participated in the Cooking Up Change initiative, a facet of the Healthy Schools Campaign, which challenges high school students to create recipes that meet school food guidelines and budgets. In her capacity as a mentor and coordinator, she traveled to Washington, D.C. with students to compete nationally and meet with Arizona senators about keeping strong school food policies in place. The second year of the contest, students Martinelli mentored at Barry Goldwater High School in Phoenix placed third in the national competition. She is currently working to expand the program statewide for the 2018–2019 school year. “The best way to improve our health as a nation is to help people learn to adopt a healthy lifestyle before they get sick,” she said. “We all know that it is very difficult to change health behavior once we have established habits. I see the healthier school lunch guidelines as a chance to raise a generation of students who enjoy healthy foods — a generation that does not have to unlearn bad habits.